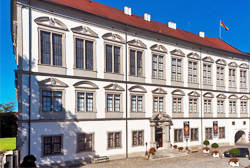 The seventh International Violin Festival will take place in late summer 2018 in the royal-residence town of Oettingen in Bavaria. During the weeklong master courses, music students, young professional musicians and talented students will have the unique opportunity to study with internationally renowned violin, viola, cello chamber music instructors, thereby adding important impulses and new ideas to their musical and artistic development. Each participant will receive high quality instructional sessions from the professor of their choice (where possible). All professors will also instruct chamber music. Existing ensembles are welcome. 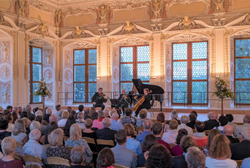 With its exquisite ballroom adorned with Wessobrunner stucco, the Oettingen Residence Palace provides a memorable setting to spotlight the concert experience. Participants will not just attend performances of renowned artists from around the world in the professors’ concerts; they will also have the opportunity to gain valuable experience by performing a rehearsed piece at the final participants’ concerts.